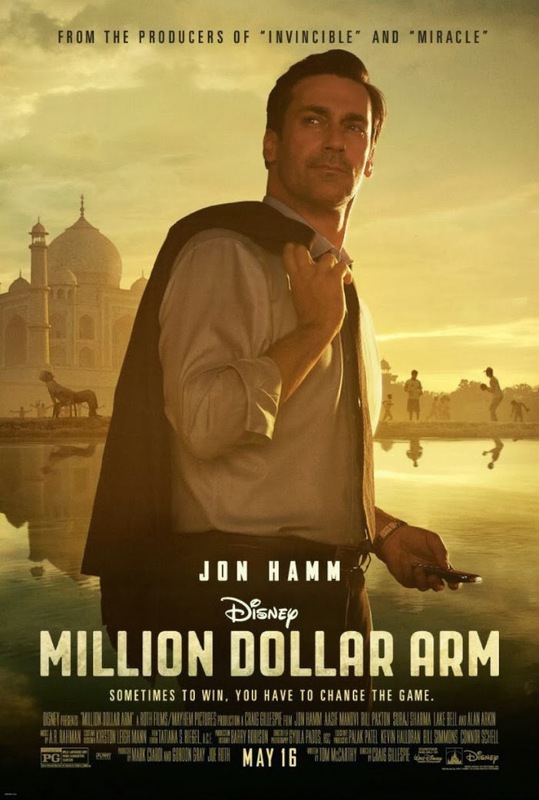 I saw the first trailer for Disney's Million Dollar Arm in front of American Hustle the other day and while I was surprised by the fact the trailer was for a film I'd not previously heard of it became clear fairly quickly exactly what type of film this was. There is nothing wrong with making the inspirational sports story into a film and sometimes they turn out rather well. I enjoyed both previous films in the same vein quoted on the poster (Miracle and Invicible) but have yet to re-visit either of them since their initial release. Like those films Million Dollar Arm puts a strong leading actor in the midst of extraordinary circumstances within the sports world and plays out in predictably inspirational fashion that has our protagonist revolutionizing the way people look at the conventions of major league competition. While I won't be highly anticipating Million Dollar Arm I will be more than pleased to sit down in a theater and experience what the film has to offer. Jon Hamm plays a sports agent who, after hitting rock bottom, travels to India and set up a televised game show to scout the top cricket players in the country and see if any of them have what it takes to make it in the major leagues. The script was written by Tom McCarthy (Win Win) and directed by Craig Gillespie (Lars and the Real Girl). Million Dollar Arm has a strong supporting cast as well that includes Lake Bell, Bill Paxton, Aasif Mandvi, Alan Arkin, Suraj Sharma (Life of Pi), Madhurt Mittal (Slumdog Millionaire) and opens May 16, 2014.